Vladimir Tarasenko led the NHL with seven points last week. ST. LOUIS – Vladimir Tarasenko is among the many reasons the St. Louis Blues enter the Stanley Cup Playoffs on a roll, as the NHL is well aware. 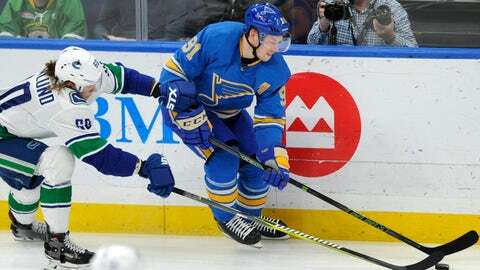 The league announced Monday that Tarasenko has been named first star for last week. Tarasenko led the NHL with seven points (three goals, four assists) in four games last week as the Blues earned seven out of eight possible points with wins over Colorado, Philadelphia and Vancouver and a shootout loss at Chicago. • One goal against the Avalanche. • One goal and one assist against the Blackhawks. • Two assists against the Flyers. • One goal and one assist against the Canucks. Tarasenko finished the regular season with 68 points (33 goals, 35 assists) in 76 games, making him one of two players with at least 30 goals in each of the past five seasons. The other is Washington’s Alexander Ovechkin. The league’s other two stars for last week also come from the Central Division: Nashville goaltender Pekka Rinne (second star) and Dallas forward Alexander Radulov (third star).